A collection of the latest Cardcaptor Sakura gifts and merchandise you can buy online! Includes products such as t-shirts, costumes and accessories inspired by your favorite magical girl series. Not only is this Cardcaptor Sakura rug great for summoning Clow Cards, it’ll also help tie together any room of the house! Made from soft, high quality materials, this non-slip rug creates the perfect addition to any Magical Girl’s room. Now fans can also attend Tomoeda Elementary School with this adorable Cardcaptor Sakura backpack! 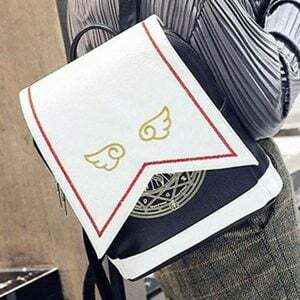 Inspired by Sakura’s school uniform, this bag also sports the wings emblem and magic circle on the back.